The culture of Australia is showcased within its diversity, from its red center to its northern billabongs. Deep within the country’s heart, from the giant monolith to the underwater crocodiles, the landscapes have shaped the local people and their history. 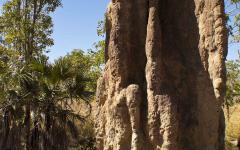 The art pops from the ancient rock formations. The sand burns as bright and as red as the sun. This is Australia’s proud history, where the natural world offers you the unique view of the famous outback, from the center on upward. 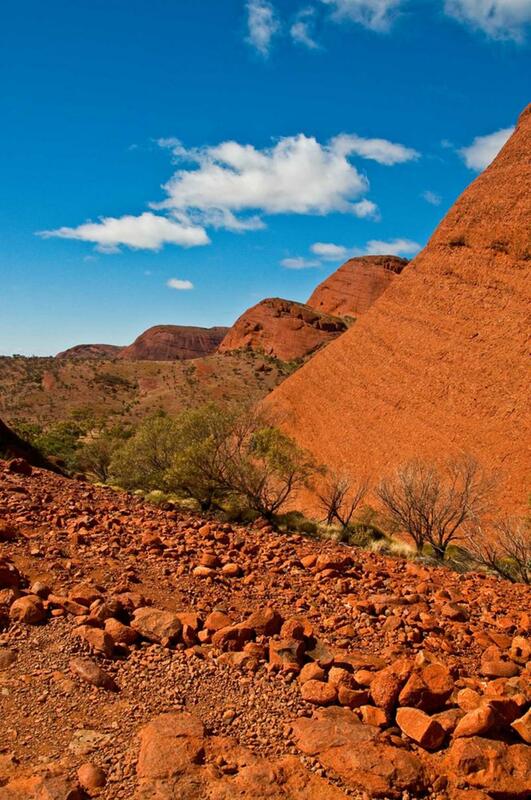 Venture deep into the culture of Australia on a 7-day tour wandering through the landscaped majesty of the Red Centre and the Northern Territories of Australia. The spring waters sparkle clear blue, bubbling up from the earth. The rocks glisten red and feel smooth on your fingertips. The sky is perfumed with the sweet scent of the sea and the rugged arid desert. 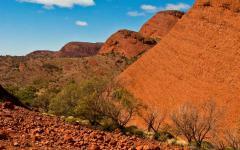 Venture across parts of the perilous landscape of Australia and witness its sensational splendor. From the still waters of the northern billabongs to the rock art encircling the famous Uluru, your custom tailored journey through Australia’s Red Centre will bring you deep inside the wondrous culture until the past and the present surround you. 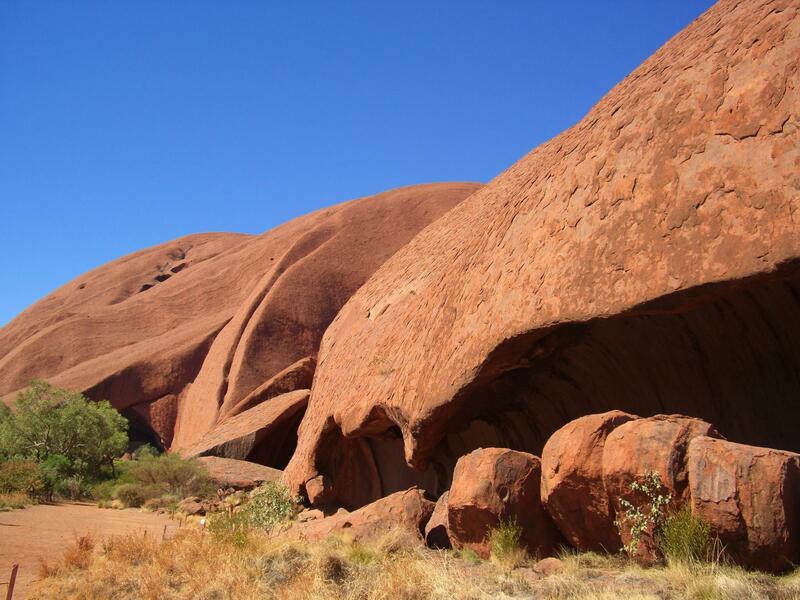 Your cultural adventure begins upon your arrival at Ayers Rock Airport where you will tour the base of Uluru (Ayers Rock) to see the magnificent magnitude of the monolith, along with the rock art hidden within the crevices. A visit to Mutitjulu Waterhole shows the sparkling water glistening from beneath the earth’s surface and rising for the refreshment of the local people and animals. 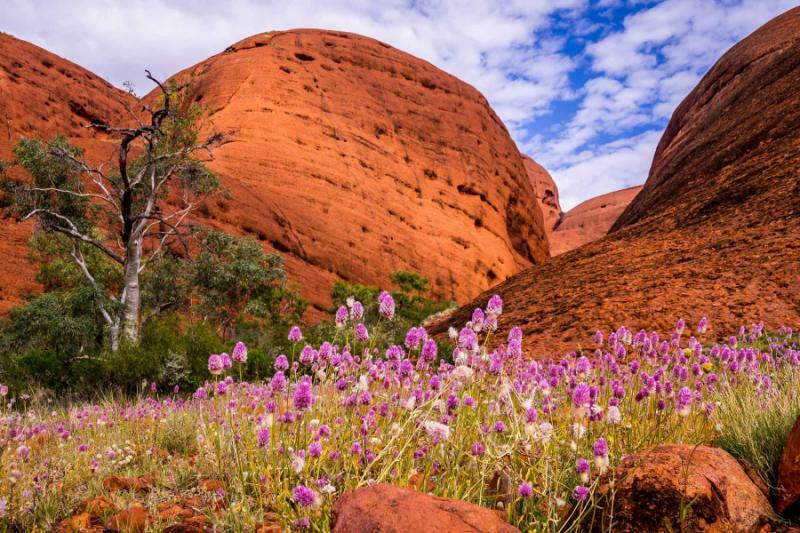 Once inside the Uluru-Kata Tjuta Cultural Center you can follow the legend of the Rainbow Serpent around the history of the territory, its people, and the wonderful legends that come with antiquity. 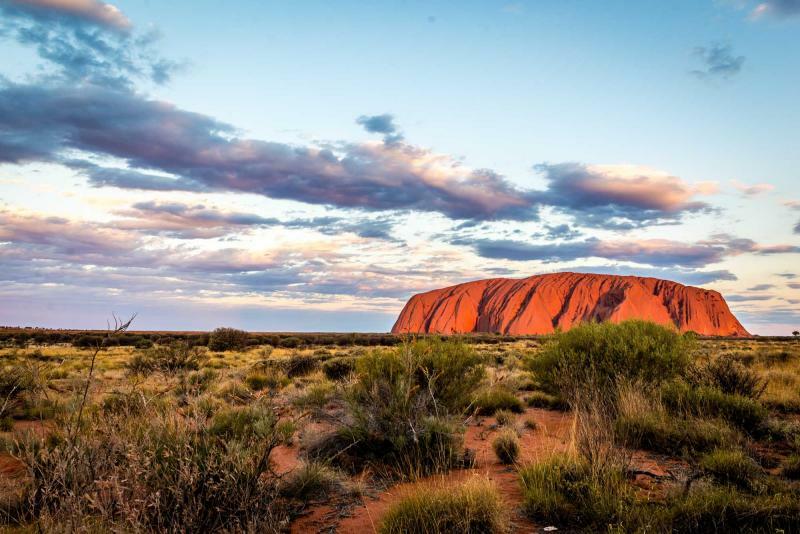 Watch the sunrise over Uluru and witness the spectacular colors of the sky reflect off of the famous monolith until the sun sits high in the sky and Uluru returns to its natural shade of bright red. 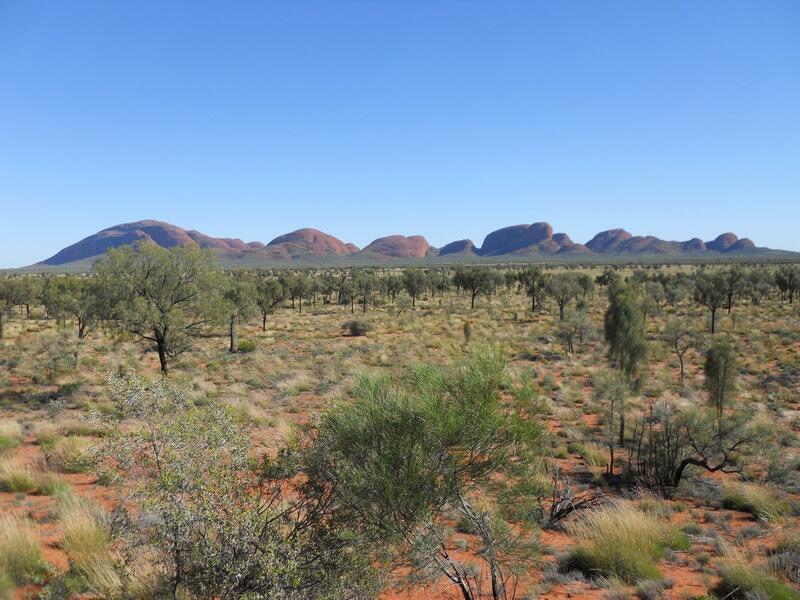 Follow your guide through the majesty of Kata Tjuta, also known as the Olgas, for the collection of large, round boulders that are said to resemble a group of earthen heads. Watch over the Valley of the Winds before arriving in Alice Springs. 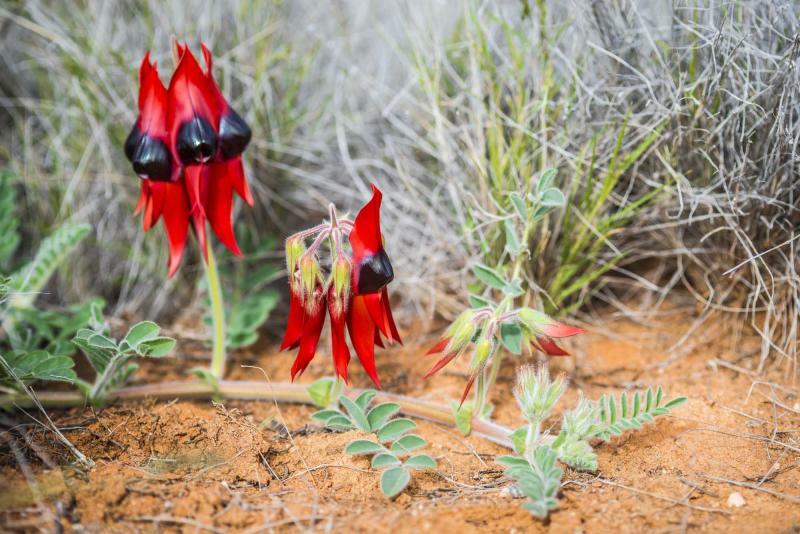 In the morning you will follow your Aboriginal guide into the wonders of the desert that surround the Alice, where you will be shown the majesty of the Arrernte People, from their traditions to their survival techniques, along with a visit to the renowned Desert Park. 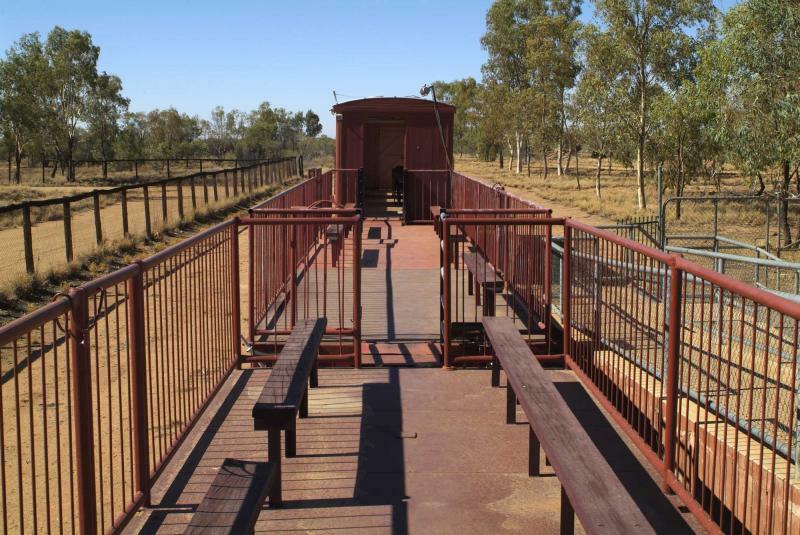 After your visit with the indigenous animals of the Australian desert at Desert Park, you will make your way to the train station and climb aboard the luxurious Ghan Train that will take you north to Darwin. Arrive in Darwin in the afternoon with the day at your leisure. Whether you wish to wander along the esplanade and sit beside the sparkling waters of the coast, or visit the World War II memorial museum, there are always wonders to see and a variety to take part in when visiting Darwin. 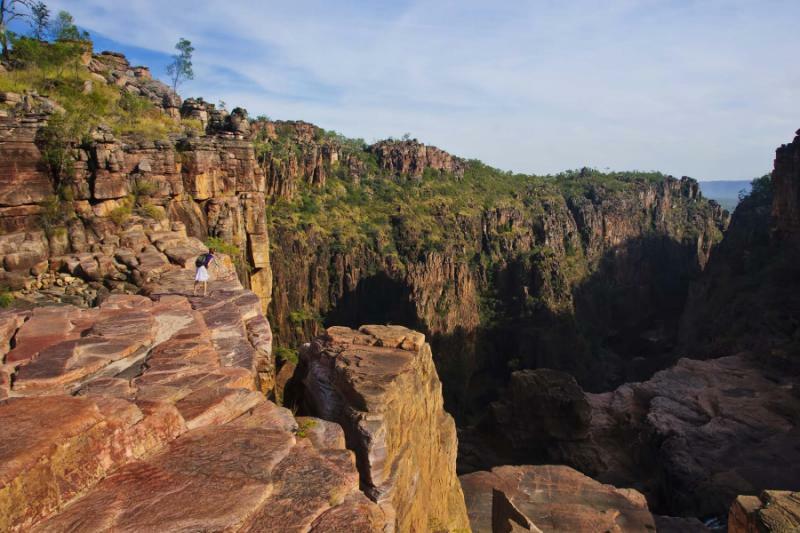 The next day you will transfer to the secluded Kakadu National Park known for its wondrous natural landscapes and connection with the local Aboriginal tribes. Rock art fills the area, notably at Nourlangie Rock. Along the Yellow Water Billabong you will feel the warm, salty waters that drift in from the sea, where lily pads sit in the sun and birds spread their wings on the banks. The next day you will stop in Ubirr to visit the rock art that connotes much of the local tribe’s connection to the land. Cruise along the East Alligator River to see the incredible strength of the local saltwater crocodile. 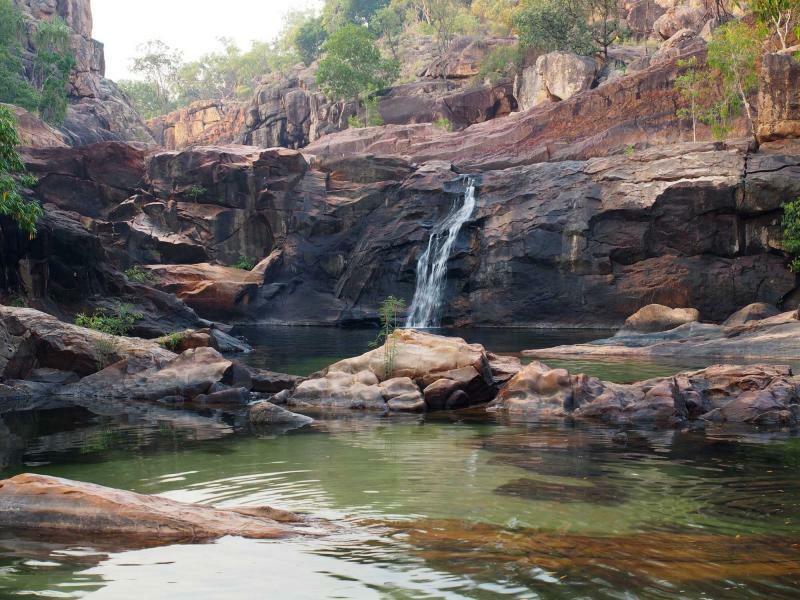 With permission from the locals, follow your guide into the Arnhem Land to visit the Bowali Visitor Center and, possibly, enjoy a flight above the sensational landscape of the Arnehm Land Escarpment before returning to Darwin. Although this particular journey may eventually come to a finish your adventure doesn’t have to end. 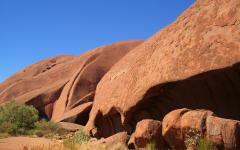 There is always more to see, making Australia vacations a timeless experience. 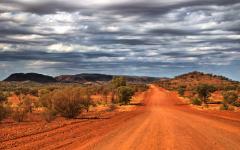 Your cultural adventure through the outback, and beyond, will be an experience of a lifetime! 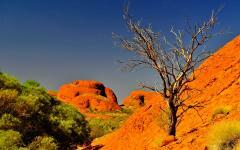 Arrive in the Red Centre ready to be inspired by the wonders of Uluru (Ayres Rock). The sand glows a vibrant red from oxidization that stretches across the depths of the valley. Experience the majesty of the Mutitjulu Waterhole where the orange sandstone surrounds the water and glistens like pastels in the sunlight. The scent of fresh water and barren earth fills the air. The water gently trickles from the earth offering life to the arid region. When the rains come the water careens down the smooth sandy stones and drips into the waterhole, making the rounded rocks look as if they are melting into the earth. 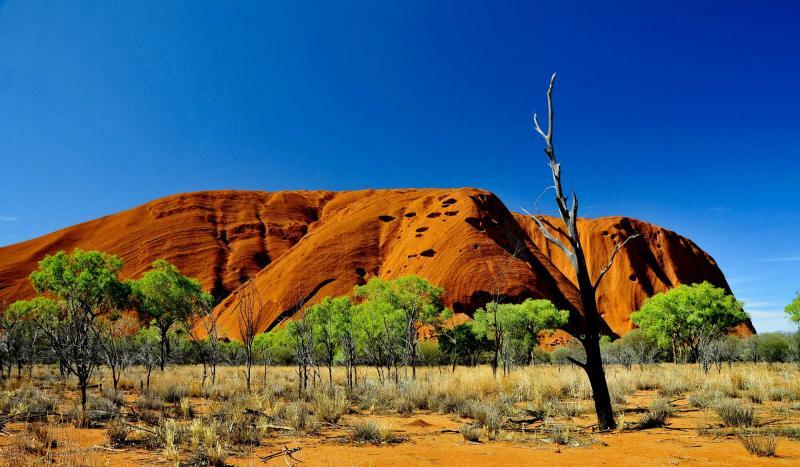 Your day continues with a visit the Uluru-Kata Tjuta Cultural Center where the legends of the region and the famous monolith are kept. The thatched roofed buildings sit beneath the hot sun surrounded by the red sand and desert brush. 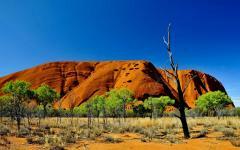 Uluru stands tall in the distance, the largest monolith in the Southern Hemisphere, glowing in the daylight. Enter the center and feel the deep hum of the didgeridoo echo around the room. The bright colors of the Rainbow Serpent slither around the room offering the creation myth of the serpent and the legend of Dream Time. The Cultural Center is operated by the local Aboriginal tribe in conjunction with the Australian Government to help ensure the lasting legacy of the people, the place, and its majesty. The sunset over Uluru brings with it a delicious glass of wine that will offer a taste of the colors of the setting sun wrapped up in the rich purple of the glass. The sun sinks behind the horizon and changes the bright red hue of Uluru to almost the same shade of the wine as the bright pink of the sky fades to night blue. The morning sun rises in the distance bringing rich oranges and bright blues. Uluru shines in the light, changing colors with the sky until the monolith reaches its full potential of full red. 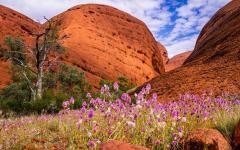 The sky fills with the scent of morning earth and you make your way to Kata Tjuta, also known as The Olgas. The three large domed rocks stand tall above the red sands. Follow your guide along the trails that will take you within, over, and through the giant desert boulders. Wander deep into caves where water trickles and remains from past rains, the scent of damp limestone filling the cavern. 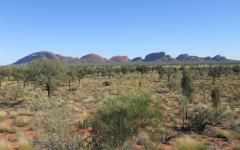 From atop Kata Tjuta you can watch the dry green stretch over the red sands along the Valley of the Winds. Sit beneath the shade and listen to the legends of the valley and the boulders, hearing the timber in your guide’s voice as they explain the origins of the Red Centre the way it has been shared for millennia, through the oratory of passing stories. The sun passes through the sky bringing in the late afternoon. You will make your way to Alice Springs and settle into the luxuries of the Alice Spring Crowne Plaza hidden within the ridge of the desert mountains, in the oasis of the desert city. Begin your day with a greeting from your local Arrernte Guide who comes from an Aboriginal community that continues to be the traditional custodians of the Arrernte lands, now known as Central Australia, which includes Alice Springs. Follow your guide out of the city and into the arid landscape stretching through mountain ridges and across the red sand. Listen to the sweeping wind brush across the desert like rain. 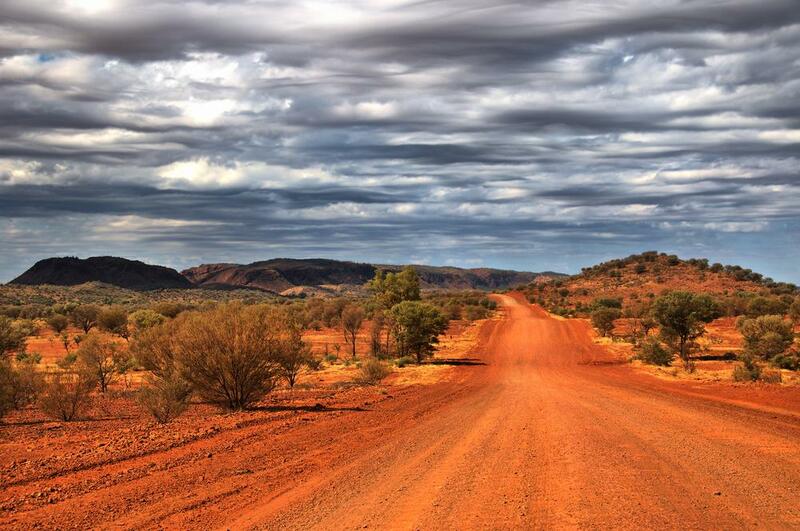 The ancient stories of the Arrernte people fill the sky. Your guide will demonstrate life in the area, and learned survival tips that have been passed down through generations, keeping tribes alive in the pulsing sun of the region. 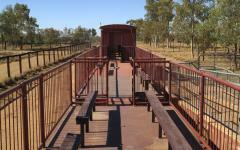 In the early afternoon you will be taken to the Alice Springs railway station to join the famous Ghan Train to Darwin. The scent of fresh coffee and pastries fills the train car as you explore the modern luxuries of an antique train journey through the Red Centre. The linens are plush, the air is cool, and the scenery outside the window stretches a red that goes on forever. Keep your eyes open for the wild camels that wander the desert. Brought from Arabia around the turn of the 20th century, the camels now roam the desert in private caravans; it is no wonder that the camel is the symbol for The Ghan. Sit back, relax, and enjoy the unique train journey to Darwin. 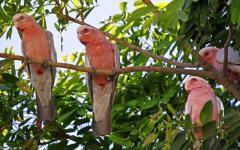 Arrive in Darwin in the mid afternoon and be whisked away to your beautiful accommodation along the Darwin Esplanade. The remainder of your day in Darwin is yours to explore the stunning sights of the city. One of the pleasures not to be missed in the seaside city is the barramundi; this fresh fish can almost be tasted from the shore, its rich aroma drifting from the restaurants that line the esplanade. Whether you wade into the water with a fishing rod to catch your own or just wander along the luscious scents of the seaside boardwalk, the delicate taste of fresh barramundi will keep calling to you long after your have tasted its wonders. The Waterfront Bistro is a part of the Darwin Sailing Club where you can watch the shifting colors of the ocean at sunset. The succulent fish is lightly seasoned as to not overpower its natural flavor. There is no more perfect a collection than the setting sun, the lovely flavors of the regional cuisine, and the Australian coast glistening before you. 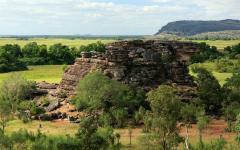 Today you will venture outside of Darwin and into the stunning sights of Kakadu National Park. 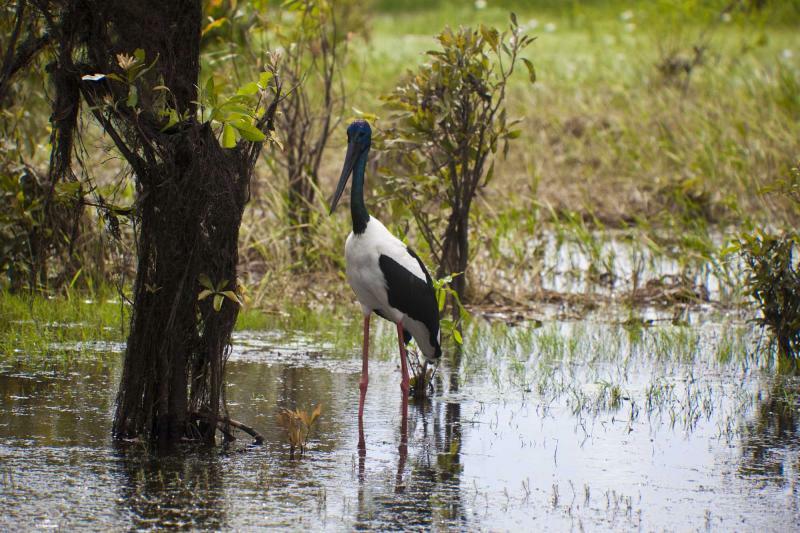 Set deep in the region of the Northern Territories, Kakadu National Park houses some of the most iconic nature and stunning history outside of the Red Centre. The waters linger in the wet season and offer vibrant life to the indigenous people and the animals that have called the continent home for millions of years. Follow your guide around the waterways, through the billowing grass, and to Nourlangie Rock where Aboriginal rock art almost jumps from the limestone out into the world. 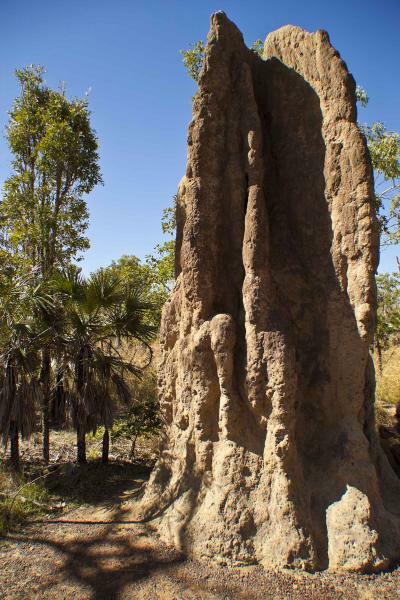 The rock is an outlying formation on the banks of a billabong. The art exemplifies the people, culture, and animals of the region through time and, at times, looking like geometric configurations created by modern artists. The air is perfumed with the mint of eucalyptus and dried brush. The mountains glow in the pink sky. Your day continues with a cruise through the Yellow Water Billabong to witness the dangerous beauty of the saltwater crocodiles and the expansive majesty of the bird life in the area. Lily pads spread across the water. The warm water of the billabong purely reflects the riverbanks as you drift through. Pelicans stand on tree roots, spreading their wings to dry in the afternoon sun. Egrets dip their heads beneath the water and dig for tiny fish or bugs. Crocodiles sit along the shore and warm themselves in the sun. The closer you come the wider their mouths open to signify their territorial nature, ready to defend their area if need be. Blue lilies sprout along the shore and drift in the breeze, and before you know it your exploratory cruise through the Yellow Water Billabong comes to an end. 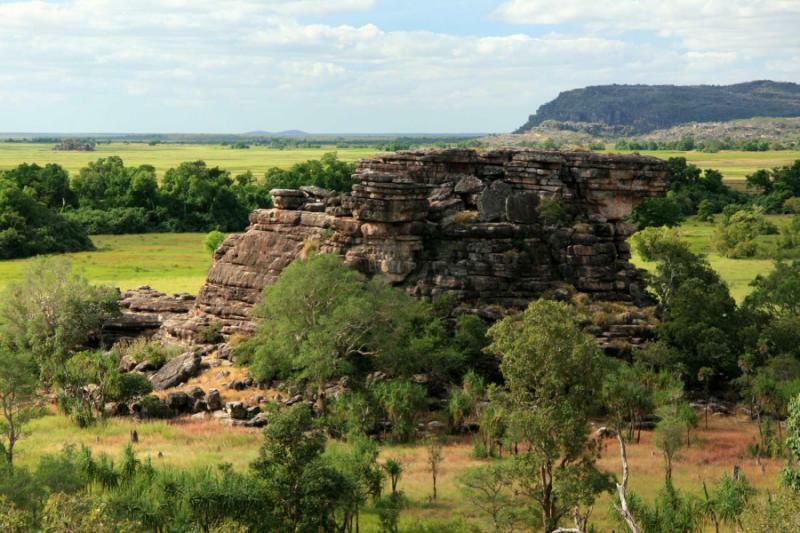 Today you have the unique opportunity to step inside most often forbidden territory, with the permission of the local people, to explore and experience secluded areas of Kakadu National Park. Your exploration begins with an art walk in Ubirr to see the stunning rock art that has informed locals, visitors, and professionals alike. The art depicts traditional foods and tells stories of law and creation. The gentle breeze flows through the trees and around the rocks, helping conserve the art for future generations. Once on the Guluyambi Cruise you will drift along the East Alligator River where many saltwater crocodiles nest. Whether winding through the water or relaxing in the sun, the crocodiles are an awesome sight to see, their raw power apparent in their every movement, and even in their tranquility. With permission granted, and accompanied by your Aboriginal guide, you will climb ashore in Arnhem Land and visit the Bowali Visitor Center. Step inside to see one of the largest crocodile skeletons in the region, housed and labeled to better educate visitors about the agile, cunning, and powerful reptile. The center, along with your guide, will be able to lead you through the history and mythology of the region, including the reason for its seclusion. 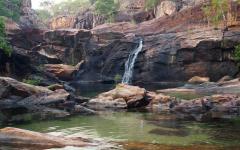 There is also a unique chance to partake in a tour of Arnhem Land through the sky. 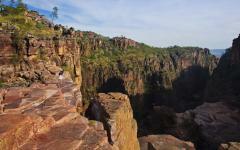 Once you lift into the air you can see how Kakadu differs from the rest of Australia, and from the rest of the world. The mountains drop into cliffs that fall along a sea of trees. The waters are clear and expansive, stretching around and between rocks, trees, and brush. From above and within Arnhem Land you will see the beauty and magnificent magnitude of the region before returning to Darwin. Today brings an end to your time wandering through the cultural wonders and landscaped majesty of the Red Centre and the Northern Territories. The waters have sparkled clear blue, bubbling up from the earth itself. The rocks have glistened red and felt smooth on your fingertips. The sky has been perfumed with the sweet scent of the sea and the rugged world of arid desert. 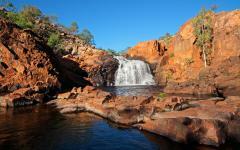 You have ventured across some of the perilous landscape of Australia and witnessed its sensational splendor. Although this particular journey may have come to a stop, that doesn’t mean that your adventure has to end. 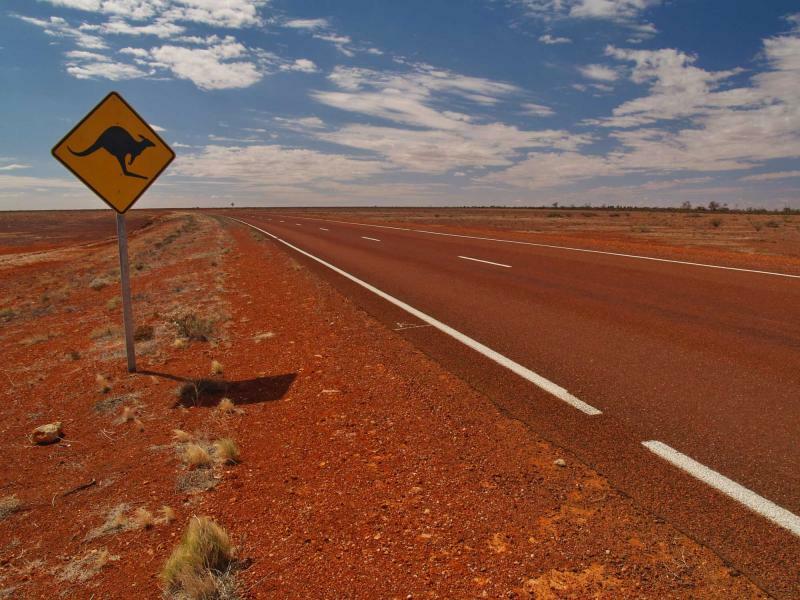 There is always more to see and experience in Australia and the Southern Hemisphere, which makes your cultural adventure through the outback and beyond timeless and, possibly, even endless. 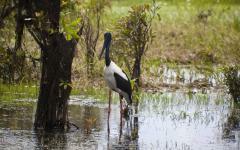 Related Information: This itinerary provides a unique way to experience the central part of Australia, including a train ride, cruise in the Kakadu National Park, observing wildlife first-hand in truly spectacular scenery. 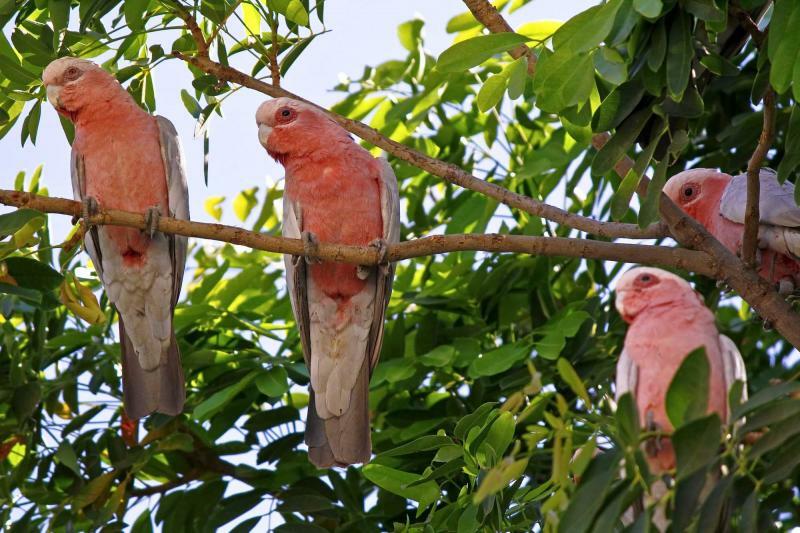 You can certainly add additional days, activities, and places to visit and choose from many lodging choices in Darwin to fully customize the itinerary. As vast as this continent is, there are plenty of reasons for you to extend your vacation. 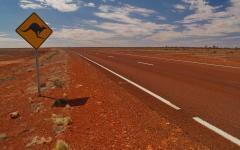 Be sure to read the travel reviews for Australia vacations.